This post brought to you by The Original ScrapBox. Hello, hello! 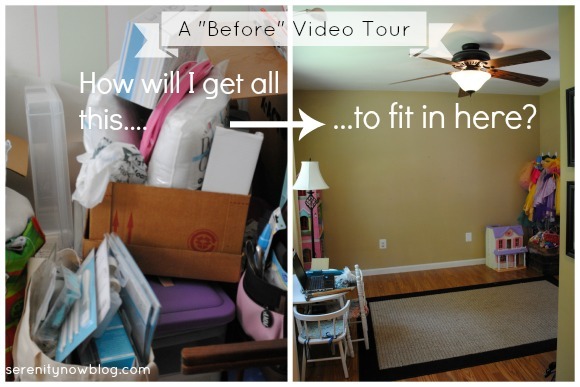 I'm headed up to our IKEA for some shopping fun, but I thought today would be perfect to show you a quick "Before" Video Tour. You may remember the very embarrassing post I shared last month with photos of Natalie's old room (soon to belong to baby boy) and the girls' play area. I dreaded sharing my craft supply chaos with you guys, but I received so many encouraging comments and emails. It seems that many of you also have a secret room or closet where you stash stuff. I'm excited to be calling it quits with the clutter and working with The Original ScrapBox to get things organized. I'll share more about the WorkBox and the process of putting it all together in an upcoming post, but today is all about giving you a closer look at the awful mess I created. I don't know if I've ever given you guys a close-up look at our addition, which is where 90% of the girls' toys reside. (Side note: Please excuse the tarp over our shed outside...a storm took the roof out and we're waiting on the tree guy to come and take care of things before we can replace everything.) So, hopefully today's video tour will give you a better idea of the space I have to work with. I can't wait to show you guys the WorkBox in our downstairs space once the shelves are in and supplies relocated. I have a list of to-do projects a mile long that I'm hoping will be made easier with a new workspace! Most exciting is the transformation from little girl's room-turned stash area to baby boy's nursery. I have a lot to do! What's your biggest organizing challenge? Disclosure: This is not a paid post, but I received product from The Original ScrapBox in exchange for an honest review. As always, all opinions expressed are 100% my own! I'm excited to see what you do with the space, Amanda! I can't imagine trying to create & blog with kiddos, not to mention a baby! I've no doubt you'll pull it all together, and I can't wait to see! I can't wait to see your work box in action!! Totally envious because I know it's going to be awesome! Hey, it's not THAT bad!! But I'm so excited to see you get organized with a new WorkBox. I've always wanted one so I can't wait to see how it works for you!! I don't think this is bad at all. Is that bad? I am really bad about accumulating stuff. Don't open my closets or cupboards! Oh, my craft room is a den of clutter and chaos. I need all of the inspiration I can get! So fun to put a voice with a face! Girlfriend I have seen FAR worse (I once worked alongside another girlfriend of mine to help another girlfriend who had recently divorced clean her house to get it ready to sell...multiply your pillows to every square inch of a 3500 square foot house). Wish I lived closer...I lend a hand...I love organizing stuff like that. The work box is going to be awesome!! Can't wait to see the end result! I am pretty jealous that you get to organize all your stuff in a Workbox! I could SOOOOOOOOOOOO use one of those!! Trust me I feel your pain! We have junk piled all over the place and we can hardly even open the closet in the basement. Can't wait to see your "After" pics! You're inspring me to start getting organized. Oh my goodness, I can't to see your after. How exciting! I think it's wonderful that you'll have an organized space where you can craft and the kids can play. I am excited to see how you fit all of your supplies into your new unit.